Canadian Achievement Tests Fourth Edition (CAT.4) has become one of the most widely used series of achievement tests in Canada and focuses in the areas of mathematics and language/reading skills. As an indicator of PCA’s student performance levels vis-à-vis national performance rankings, PCA administers the standardized Canadian Achievement Tests each year to two different grades. This year the Grade 3 and Grade 7 classes were administered the CAT4 battery of tests just one month into the year. The exact grade level testing, therefore, was 3.1 and 7.1. The skills areas that were targeted for Grade 3 were reading, word analysis, vocabulary, writing conventions, mathematics, computation/estimation and spelling. As a class, the Grade 3’s scored a grade equivalent rating of 4.3 in 6 of the seven areas. The Grade 7’s were tested for reading, vocabulary, writing conventions, spelling, mathematics and computation/estimation. The mean grade equivalent ratings for Grade 7 averaged 9.9 (almost Grade 10 level!) in all areas tested. These outstanding results reflect very favourably the calibre of our students and the quality of our teaching. For more information on CAT.4, you can visit the website, here. The Ontario Secondary School Literacy Test (OSSLT) is administered annually and is an Ontario Secondary School Diploma requirement. Students are eligible for the first time in Grade 10. If students are not successful in Grade 10 or enter Peoples Christian Academy in Grade 11 or 12, the Literacy Test may be written during Grade 11 or 12. Since 2003, PCA has had an over 90% success rate for all participating students. For more information on OSSLT, visit the EQAO website, here. 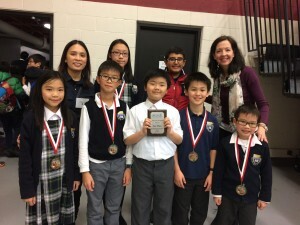 Grades 5/6 boys team – placed 2nd overall & won best score for this division . Both PCA Elementary and Junior Teams placed 2nd overall in each of their divisions.